VersionOne is one of the leading agile tools that we feature in our list of requirements management tools. In an earlier blog post from 2015, we surveyed its then latest developments. These were: Epic Dependency Visualization, Strategic Themes, Epic Timeline Drilldown and Scorecards. Now we find it’s time for an update. Since spring 2015, VersionOne has delivered several builds, bundled into 3 major release streams named Summer 2015, Fall 2015, and recently in January the Winter 2016 release. This blog post highlights and summarizes some of the major capabilities that have been added in the timeframe since our previous blog. Note that feature capabilities depend on the VersionOne edition chosen by an organization. For an overview of the four editions Team, Catalyst, Enterprise and Ultimate look up the VersionOne edition overview. The Summer release 2015 provided enhanced visibility about commit information. The CommitStream TeamRoom panel provides the stream of commit data relevant to all work items for the entire list of repositories that has been configured. The panel can be configured by users to view only the repository commit information they are interested in. Project management support has been enhanced by introducing budgeting capabilities. Total capacity may be allocated to the entire organization for a certain timeframe and then split into project based budget segments. The Fall release 2016 added capabilities to set budget for strategic themes. These capabilities are available under the topic of portfolio planning. The Winter release 2016 added a Timesheet feature which allows team members to enter time spent on work items in an environment they are used to. The Timesheet page displays a team members time tracked against items for an entire week. Reporting capabilities got enhanced in every release. The Summer release 2015 provided additional scorecards, like TeamRoom Scorecard and Iteration Scorecard. The Winter 2016 release provided a new dashboard at the enterprise level. This Enterprise Dashboard visualizes organizational metrics in the categories: Throughput, Responsiveness, Quality, and Predictability. DevOps has become a major theme in recent years. As a strategic response to that VersionOne acquired ClearCode Labs to add continuous delivery and automation functionality into its product offering. In the Summer release 2016 DevOps Center was added to the VersionOne product as a first step. In the Winter release 2016, VersionOne announced that DevOps release automation is now available as a separate product named: Continuum. 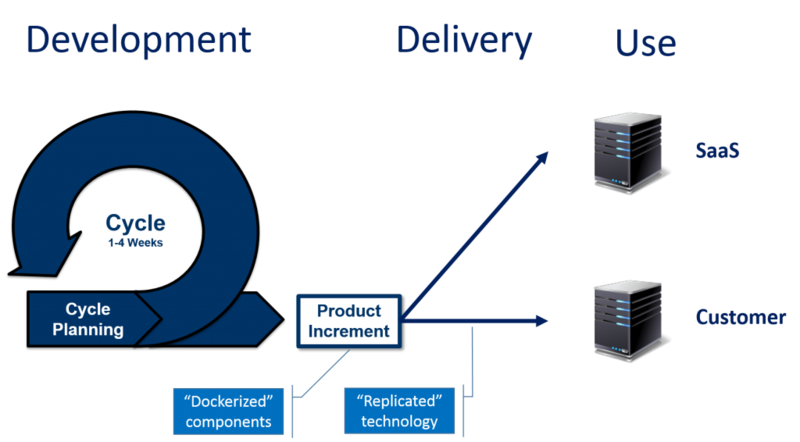 Continuum helps with automating, orchestrating and visualizing the flow of releases and their associated changes from inception to delivery. Kanban support in team rooms is now available. Teams are no longer required to have an open sprint/iteration. TeamRooms can now be configured as “iterationless”, which allows for true Kanban support. VersionOne continuously broadens its capabilities in their already rich featured agile tool. From our point of view, it delivers one of the most complete solutions for agile teams. While they have added impressive support for large scale agile development in recent years, they did not neglect to refactor and streamline their core offerings as triggered by requests from their user base. For the February 2014 update of our list of requirements management (RM) tools, my colleague Gerald Heller and I researched for other lists of requirements tools, in order to extend and complement our collection. In the following you find the results of our investigation. Each list has its specific strengths and focus areas that are outlined in brief comments on each entry. INCOSE’s RM Tools List (http://www.incose.org/productspubs/products/rmsurvey.aspx) has been the first large RM tools list we know of that was researched systematically. It is supplied with an extensive collection of (vendor-provided) tool characterizations. Unfortunately, the last update is from 2010 and much information stems even from 2008, so that most of the detailed tool information must be regarded outdated. Volere’s RM Tools List: http://volere.co.uk/tools.htm. Vendors provide their own brief tool characterizations. Much information is not fully up to date. But the rather extensive list provides an easy to read overview of the RM Tools landscape. Iain Alexander’s ’s RM Tools List at http://www.scenarioplus.org.uk/vendors.htm includes many tools that are not contained in INCOSE’s and Volere’s collections. A large subsection is on tools for requirements quality analysis. The Tools Journal’s RM Tools List (http://www.toolsjournal.com/requirements-management-tools) is another list that provides a good overview of tools. But it also most information is not up-to-date. Capterra’s list of requirements management products (http://www.capterra.com/requirements-management-software) contains about 40 tools and provides filtering support with regard to tool features. Ludwig Consulting Services provide a fairly up-to-date list (http://www.jiludwig.com/Requirements_Management_Tools.html) that has last been updated in 2012 but also mentions some outdated tools. It includes a brief informative introduction text and contains some tools not provided in the previous lists. IEEE Software magazine from July/August 2011 includes a tools survey (http://www.computer.org/csdl/mags/so/2011/04/mso2011040086-abs.html) that contains an elaborated overview characterization of 37 tools. The authors have set up a web page with brief characterizations of the tools. A PDF version of the article is also available from Vector’s media portal. Ideation tools list at CreatingMinds.org: http://creatingminds.org/tools/tools_ideation.htm. It contains tools from various different areas, many of which can be relevant in certain requirements elicitation and requirements definition activities. Lists of agile tools at agileSCOUT: http://agilescout.com/top-agile-tools/best-agile-tools. The extensive list, grouped into two web pages on Scrum and Kanban tools, provides a good overview using a screenshot for each tool. Listly’s BPM tools list (http://list.ly/list/CR-bpm-tools-essential-in-itsm-projects) contains 62 tools, with embedded media (screenshots, video clips) for some of the tools. The wikipedia list of UML tools (http://en.wikipedia.org/wiki/List_of_Unified_Modeling_Language_tools) provides tabular tool characterizations and feature overviws. It also contains links to other lists of UML tools. OOSE’s list of UML tools: http://www.oose.de/nuetzliches/fachliches/uml-werkzeuge/. The list includes a table of detailed information provided by vendors, dating from 2012/2013. Usertesting.com presents a list of wireframing tools (http://www.usertesting.com/blog/2012/10/23/the-ultimate-wireframing-tools-guide/) along with guidelines and recommendations for tool evaluation. The App Entrenpeneur website at http://theappentrepreneur.com/54-amazing-wireframing-tools-apps lists web apps as well as Android and iOS mobile apps with brief one-line characterizations of each tool. Memeburn’s specialty is a list (http://memeburn.com/2012/09/25-of-the-best-wireframing-and-prototyping-tools-ever/) with embedded video clips from most of the tool’s vendors. Econsultancy provides at http://econsultancy.com/blog/62700-18-practical-responsive-design-tools-and-resources-for-wireframing wireframing tools and and additional resources. creativebloq.com (http://www.creativebloq.com/wireframes/top-wireframing-tools-11121302) list tools along with platform and price information. It also contains some less conventional but interesting recommendations.